And this episode is BOTH those things! Cap and Brandon are joined by Palette-Swap Ninja, an obscure nerd band that recently made a big splash when they combined two pillars of 20th century pop culture into one unbelievable concept album. Dan Amrich is a game journalist turned Ubisoft community developer and Jude Kelley is a research scientist who repairs old arcade machines. With our collective powers combined, we’re unleashing a nerd podcast of an unrepellable magnitude. First up, we take on the listener-requested topic: failed video game consoles. We’ve all seen our fair share of pie-in-the-sky, crazy flops in the ever-ongoing console wars, but Dan’s career in game journalism grants him a special perspective. In the mid-90s at outlets like Flux and GamePro he was witnessing some of the legendary travesties – including the notorious Virtual Boy. 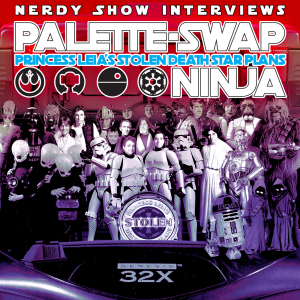 We dissect and debate just what makes a “failed” game console and get stories from Dan and Jude’s deep game nerd backgrounds, then we dive into the incredible project they’ve spent the last 5+ years working on: Princess Leia’s Stolen Death Star Plans. Celebrating the 40th anniversary of Star Wars and the 50th anniversary of The Beatles’ immortal classic, Sgt. Pepper’s Lonely Heart’s Club Band – this seamless, record-length parody tells the entire story of A New Hope. Thanks to Viral Demon and Tehmsu for this microsode topic! This July 4th, think of our brothers up North.